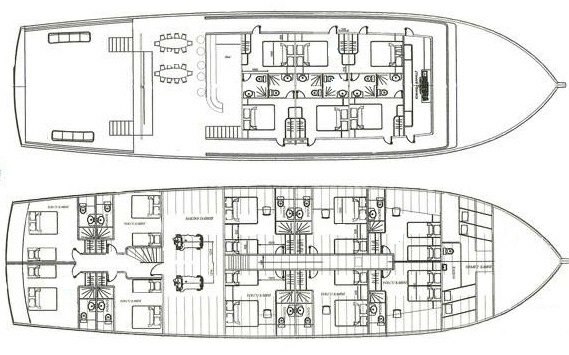 The boat has 6 doubles, 2 twins and 8 triple cabins. The twin cabins can be converted into double. Up to 36 guests. The cabins are very large and confortable. The 6 doubles are on upper deck. Captain Kamuran Şahin (1984) has worked on charter yachts since childhood. A graduate of the Bodrum Sea Academy, he spent years as captain on private yachts in Italy and the Mediterranean. With immaculate service and hospitality skills, he is also extremely adept with overseeing technical issues and running a very tight crew. He has worked with La finale for the last 2 years. First Mate Adem Ataş (1987) is a 2007 graduate of the Seamans Academy and hails from the north Aegean town of Yalova. With a background on both motor yachts as well as charter gulets Karina and Aegean clipper , he brings ample technical yachting experience as well as client service. Chef Şenol Kaplan (1982) is a career chef, having worked on cargo ships all around the globe in his youth. Now settled permanently in Bodrum, Senol Chef has ample experience catering to group functions and private parties. His last job was on motor Yacht Nina. Of his many specialties, one unique tradition is Turkish soup, which he enjoys serving late at night or at breakfast in the Turkish style, claiming its many health benefits. Chef Orhan speaks food-related English, and enjoys the art of presenting fresh, local Mediterranean food. Host Anıl zyılmazel with a very impressive background, including full fluency in English, Turkish. He can mix a mean martini, discuss world events and has ample experience with silver service. In addition to all of her charter qualifications.